the fourth. | there's no place like gnome. 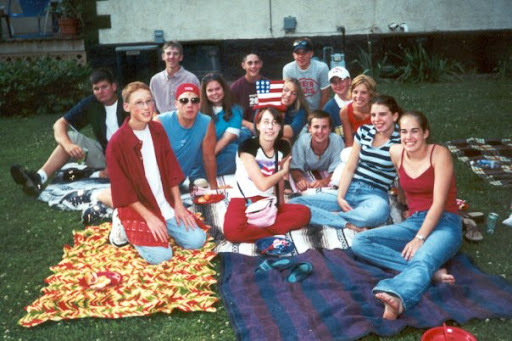 Fourth of July today looks like Lindsay on the couch watching cheesy Australian television dramas on Netflix. I’d prefer the former to the latter, please. Now, know that I haven’t been sitting on the couch all day. I worked … kind of. I went into Blooming Prairie to help sell soda and water along the parade route with the youth from ROG. I use the word help loosely; it seemed I wasn’t entirely needed so I was that awkward pastor like I am so often. I stayed in for the big BP parade – a parade that is known to draw up to 30,000 people to the town of 2200. It was hot. And long. And I think I just don’t like parades. But it wasn’t without fun. One of the members I sat next to had awesome commentary the whole way through and it was good connection time with the youth. Parade people threw tootsie rolls; that’s always a win-win. After being in the heat for much of the day, I have little ambition now that I’m at home [hence the cheesy Australian television dramas]. And I suppose it doesn’t much matter. I have no plans to go and watch fireworks because I have no one with whom to go. [here’s your invitation to lindsay’s pity party. please rsvp asp.] sigh. It’s a far cry being home alone than to the photo above with some of my bestest friends. Paige, jD, and Lauren are all out of town; I should have taken the hint and left too. Celebrating here is no fun without them.